If I recall correctly, I typed my last post with dirty fingernails and weary muscles. Well, tonight I type with nearly severed tendons. I think that is worse? It all started this morning when I decided to make the kids blueberry muffins (just from a box, so don’t go all Supermom on me). I reached into the fridge for the eggs, and somehow flipped a bowl of carrots upside down and all over the floor. Did I mention the carrots were floating in water? Water that was now soaking my jeans, socks, floor, and swiftly sliding out of reach under the refrigerator? As I mopped up the mess, I consciously thought, “This does not have to be my day.” I made the muffins, and while they baked I tugged the fridge out and cleaned up underneath and behind it. An opportunity! How often does one think to clean behind the fridge? This could count towards Goal #3, and it wasn’t even 10 AM! Lucky me! After the fridge was tucked back into its spot and the kids were happily chomping on their muffins, I had the crazy idea to get breakfast for myself. Honestly, I don’t remember why, but all I know is that I returned to the fridge for something. Unfortunately, all of our knives don’t fit on this single magnet. We also have a cleaver, fish fillet knives, and other miscellaneous blades. Because we use them so rarely, and since we don’t know what else to do with them, we piled them in an open Tupperware container and stuck them up high. You know, somewhere safe from the kids. Like the top of the refrigerator. The very same refrigerator I had just struggled to tug out and mop behind. I was ignorant to the fact that, as I jostled the fridge below, the bucket-o-knives was slowly creeping forward above. 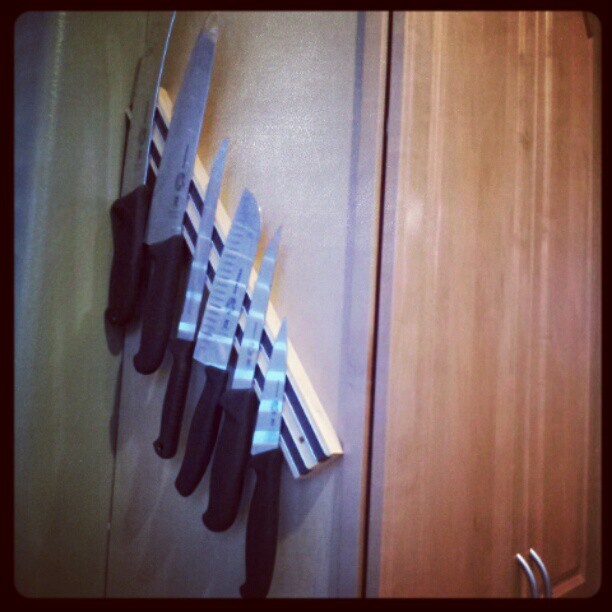 When the fridge was tucked back in its place, I had no idea that the knives were now teetering on the precipice. That the next time the door opened they would come crashing down upon whoever stood below. I jumped out of the way, but not before one blade dove into that little patch of skin between my thumb and index finger. And there it stayed, completely vertical, lodged deep enough to stand upright on it own. EEEEWWWWW! I flung it out and in a moment of panic started to run cold water on the wound, thinking it was a burn or something? It didn’t hurt until the water hit, at which point I remembered to help my platelets with some pressure. Of course we were out of paper towels, so I grabbed a washcloth and pinched the gash closed. I put on a stoic face and turned to face the kids — who were sitting at the countertop island, frozen, mouths full of blueberry muffins, but not chewing. It’s ironic that I’ve been so nervous to let the kids play outside lately, since I’ve seen two black bears in the past week and I know the moose are dropping their calves. Our back yard… May 2011. 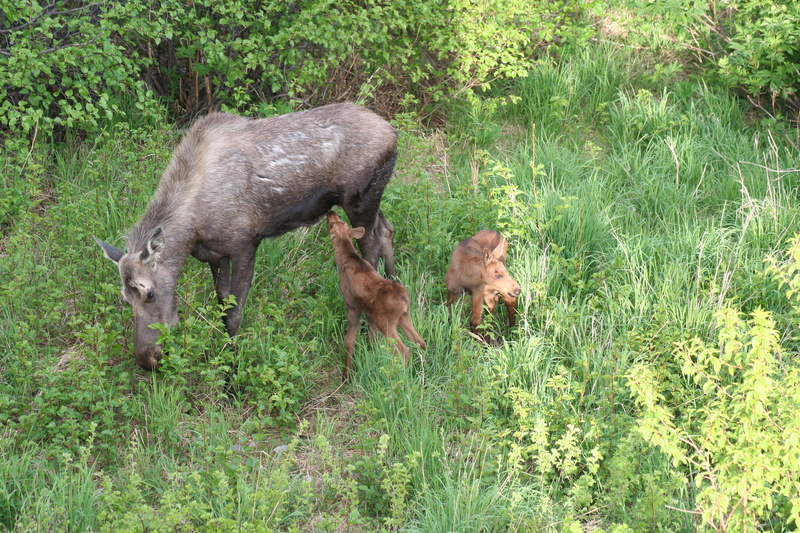 Those twin babies look downright adorable, but a friend’s daughter was trampled by a moose last weekend. Thank goodness the little girl is recovering, but it’s enough to make me want to grab my children and lock them inside. Don’t think I haven’t considered substituting fresh air and exercise for Vitamin D pills and Wii Sports. But then the knives fell. Inside. Really, there are no guarantees. No fail safe method of ensuring accidents won’t happen to those we love most. So I hold my breath and let my children go, bear bells jingling, to play with the neighbor kids. To teeter totter and swing. To ride their bikes and scooters. It would be hypocritical of me to limit their screen time and then make them watch the world through a window. You know, I hope my wound from today leaves a scar. It will be a good reminder of how lucky I was on this fine, fine day. Previous Previous post: This Blog Has Moved!